Well, we're three weeks into HBO's miniseries Big Little Lies. After three episodes, I am still so pleased with the small screen adaptation of the Liane Moriaty novel by the same name. I read the book last summer for a book club and immediately became obsessed. I recommended the novel to everyone I knew, and basically forced it down my mom's throat. Brief Synopsis: Three women of varying ages find friendship with each other as their children attend primary school together. Oh yeah, and someone's dead. As the story unfolds, their secrets begin to come to light, as the reader gets closer to finding out who the murderer is. The miniseries features an all-star cast including Reese Witherspoon, Nicole Kidman, Shailene Woodley, Alexandar Skarsgard *swoon*, Laura Dern (from Jurassic Park, y'all), Adam Scott (adorable! ), and Zoe Kravitz. As a miniseries, it's only seven episodes long and will end on April 2. So far, I've been blown away by how closely the series follows the book. It's put together extremely well, and I'm really enjoying it. But let's be honest, when does HBO ever fail to impress? I do have one pet peeve, but it's not actually anything with the show. There is literally a functioning hashtag that says #littlebiglies. No. Just no. That's not what the show is called. Stahp it! If you start your free subscription on April 2, you could even binge all the episodes in one day, and if you're not interested in keeping HBO Now, never even have to pay anything. 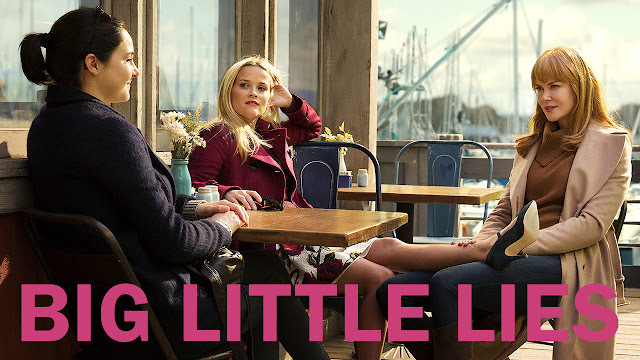 Have you watched or read Big Little Lies? Are you enjoying the series adaptation?